Embellish Magazine is having a color challenge, too. The colors are chocolate, purple, and kraft. Here is my card (all products used are Stampin' Up!). The card layers are Chocolate Chip, Elegant Eggplant, Kraft card stock. I inked the jumbo wheel in Elegant Eggplant classic ink. I stamped 'Happy Easter' in Elegant Eggplant classic ink. I dyed my ribbon with Elegant Eggplant re-inker. I stamped the bunny in Chocolate Chip craft ink, and heat embossed the bunny with ultra detail clear. I used pop dots to 'lift' the bunny off the card, so the ribbon would lay flat on the card. I was at a card party with my girlfriends tonight and saw that choc bunny stamp! I didn't order it but now I wish I did. Such a cute card! Wonderful card, Sharon! 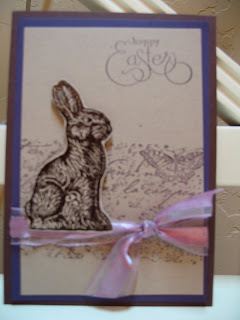 The Easter bunny stamped imaged looks great! Thanks for playing along with us!